I was part of the Elementary/Middle Grade Speculative Fiction first round panel for the CYBILS awards this year, and I think the group picked a great shortlist. One of the books that made the final list was Holly Webb’s Rose. Honesty alert: I'm not sure I would have picked up Rose on my own. It got great recommendations from readers I trust, but the cover art didn't immediately draw me in (and cover art is important!). Missing Rose would have been a shame, though, because it was a lovely read. Historical fiction mixed with fantasy, minus the usual clichés. Also... it's the first of a series, and it turns out that I cannot wait to get my hands on the next one! Absence of series fatigue is a wonderful, wonderful thing. 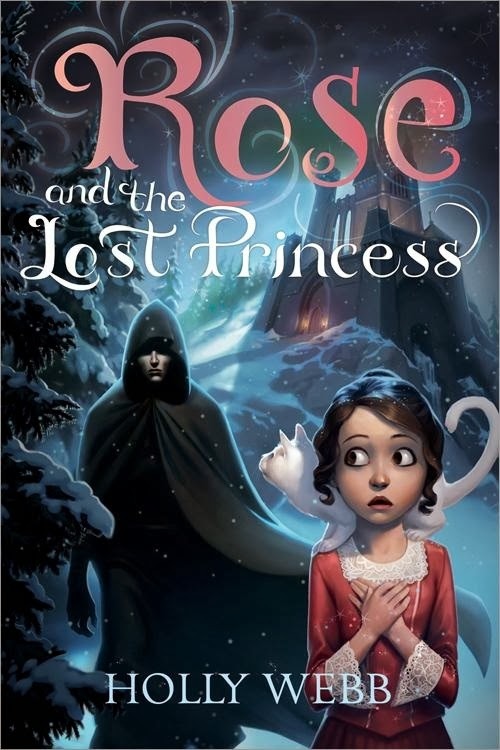 Book two (aka Rose and the Lost Princess) will be released by Sourcebooks Jabberwocky on April 1, 2014. Rose has just begun her magical training—is she ready to rescue the missing princess? Turning the worn pages of her spell book, Rose can't believe how much her life has changed. Once a poor orphan, and now an apprentice to the King's chief magician! But when the country's beloved Princess vanishes, everything changes. As rumors of dark magic fly through the city, the King asks Rose for help. She must find the missing Princess—before all is lost. I think the Rose covers are cute, but very much aimed at young girls. I'm very much looking forward to this one as well. I love this cover. She's scared but that cover is SO cute to me. Please stop by for a giveaway on my blog if you like for an international giveaway of Jubilee’s Journey. The link is below.